This is the latest abstract Ganesh painting by Padmaja Madhu, a very dear friend. She made this specially for Ganesh Chaturthi (Lord Ganesha’s birthday). She is very passionate about painting and also gives beautiful descriptions about her paintings on her blog. 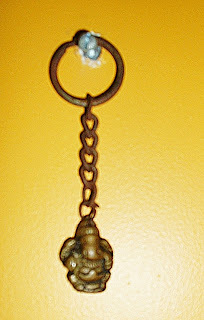 This is a 60 year old Ganeha key chain, this was sent by Padmaja. According to hindu mythology, there was an asura known as Gajamug. He was a great devotee of Shiva, and pleased with his devotion, Lord Shiva granted the asura a boon that made him invincible. Gajamug became very proud and powerful and started troubling the devas. Once he forced the devas to do 1008 Thoppukaranamsthrice a day. Tired of his antics, the devas asked Shiva to save them from Gajamug. Shiva sent Ganesha to help the devas. Ganesha went equipped with several weapons such as bow and arrow, sword, and even an axe. But the asura had been given a boon that none of these weapons could cause him harm, so Ganesha’s attempts to destroy him proved to be ineffective. Finally, Gajamug took the form of a small mouse and rushed towards Ganesha. Ganesha was very clever and immediately sat on the little mouse. Gajamug asura was defeated and made to apologise for his deeds. Since then, Ganesha is always accompanied by a mouse as his vehicle. Ganesha in turn challenged him, “Would you able to dictate as fast as I write?”. They made an agreement that once started, Veda Vyasa would not stop dictating and Ganesha would not stop writing and that he would only write what he understood. As they started the Mahabharata, whenever Ganesha wrote too fast, Ved Vyasa would dictate difficult verses. Ganesha would take time to understand them and in the meantime Ved Vyasa would compose more verses. Thus the great epic was written. On an occasion, Shiva and Parvati had been given a fruit by the devas and both the sons Ganesh and Kartikeya(Skanda) wanted it. Some legends claim the dispute was about who was elder of the two. The parents suggested that the one who circled the world three times first would get it as a prize. Kartikeya got on the peacock, his vahana (vehicle) and flew around the world stopping at all sacred spots on the way and offering his prayers. But at every major stop, he would find Ganesha ahead of him and was perplexed. Ganesha understood that his vehicle, the mouse, would not be able to compete with Skanda’s peacock and he could never beat him. He thought for a while and came up with a solution. He walked around his parents, Shiva and Parvati, three times, with great devotion. When his parents asked him why he was not circling the globe, he answered that his parents are the whole world. He need go no further to travel the whole world. 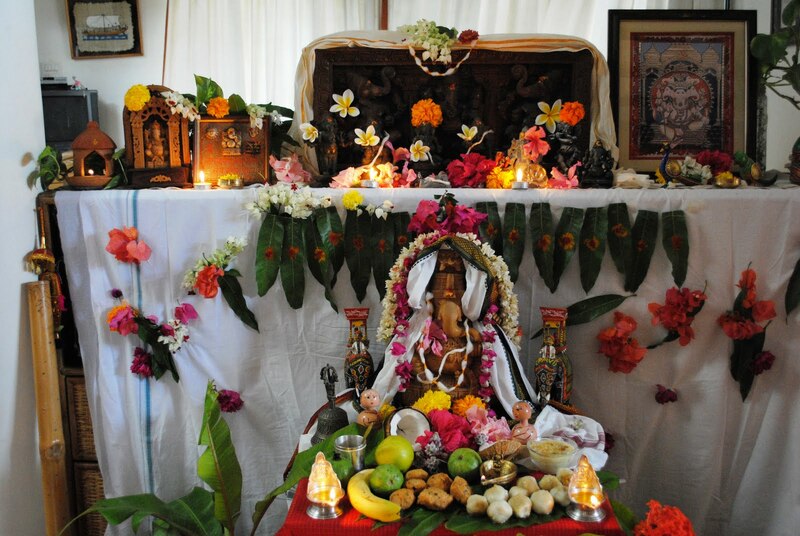 Skanda accepted the superiority of Ganesha, and bowed to him. It is no wonder then, that Ganesha is always known to be a problem solver, the remover of all obstacles. It is Hindu custom for people to always seek the blessings of Lord Ganesha before starting anything, so that all hurdles are eliminated. Riding on a mouse, one of nature’s smallest creatures and having the head of an elephant, the biggest of all animals, symbolises that Ganesha is the creator of all creatures. Elephants are very wise animals; this indicates that Lord Ganesha is an embodiment of wisdom. The process of evolution–a mouse gradually evolves into an elephant and finally becomes a man. This is why Ganesha has a human body, an elephant’s head and a mouse as his vehicle. This is the symbolic philosophy of his form. Hope you enjoyed the stories as much as I always have. Lovely post, Rama. 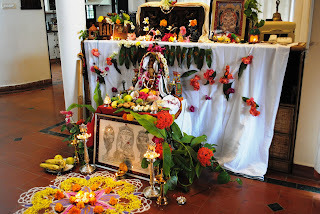 Enjoyed the pictures of Ganesha and the pookolam. 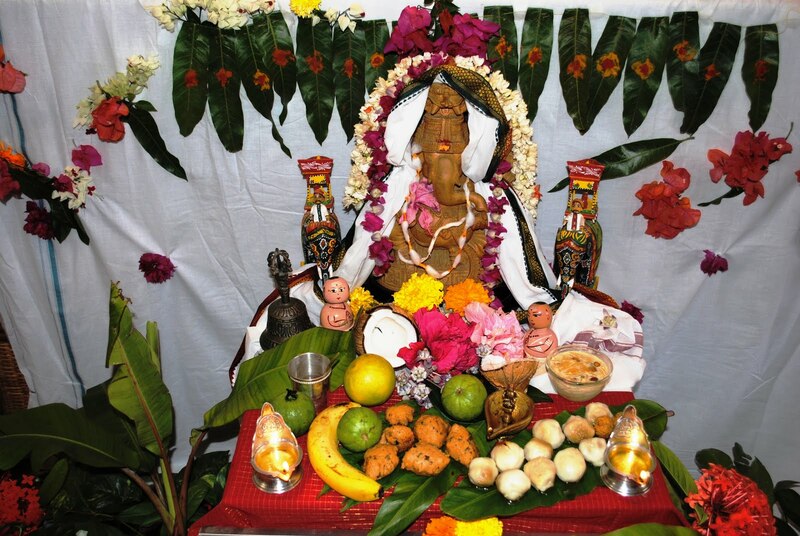 Happy Ganesh Chathurthi :)))) Ganpati Baba Mourya. Happy Vinayaka Chathurthi!!! Ganesha is my favorite and how much ever we do here - we do miss all the fun in India. Nice Rangoli with the flowers . You brought back memories from home. and moments as sweet as his laddus.Happy Ganesh Chaturthi! Happy Ganesh Chaturthi. I loved it that you brought a clay ganpati home. We had quite a few people in our layout bringing home clay ganpatis this year. Despite our requests, the society ganpati is huge and made of POP. I wish we would care more for environment while celebrating festivals. Happy Ganesh chaturthi !! !..loved looking at beautiful rangoli and prasadam !! Thanks everybody for your wishes. 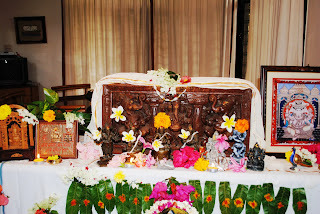 Rachna that is a wooden Ganapathi which was a gift, I don't have any clay ones, I have only stone, metal and wooden ones. I have never bought Ganeshas which are supposed to be drowned in river/ sea, even if i had clay ones I would never throw them away. Glad you liked it, and it is true it does look like a mud Ganesha. 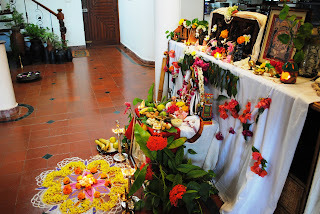 I have many ganeshas in my house as well. My son loves ganesh bhagwan. And, I have wooden and metal ones as well. I mistook this one for the clay one that visarjan is done with. The decoration, rangoli everything looks wonderful. lovely decoration especially i liked the purohit, Hope you enjoyed the festival! I love Padmaja's art, it is beautiful and this particular painting - wow!! The colors - vibrancy, etc. I love her reasons and motive for painting. And the photos of the celebration are gorgeous. My soul responds to these. Asha: Thank you for dropping by. Sandy : thank you for visiting my blog and appreciating padmaja's painting, she definitely has a way with colors. 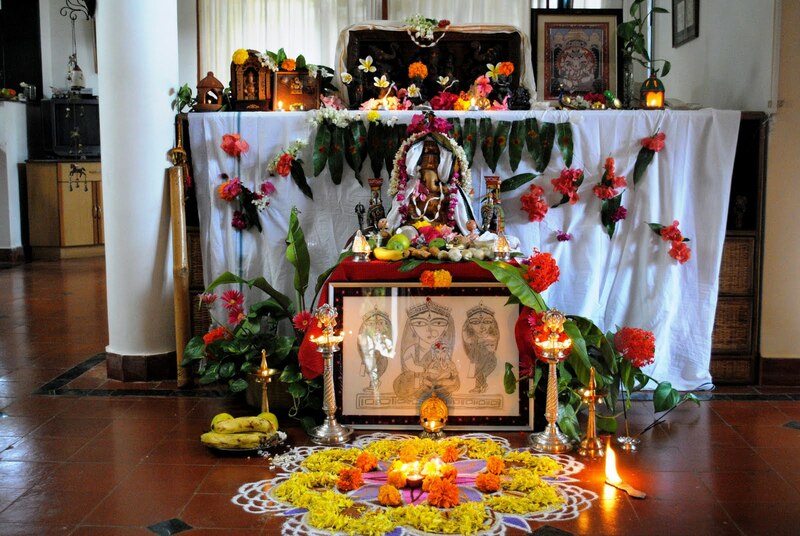 Belated Ganesha Chathurthi Rama! 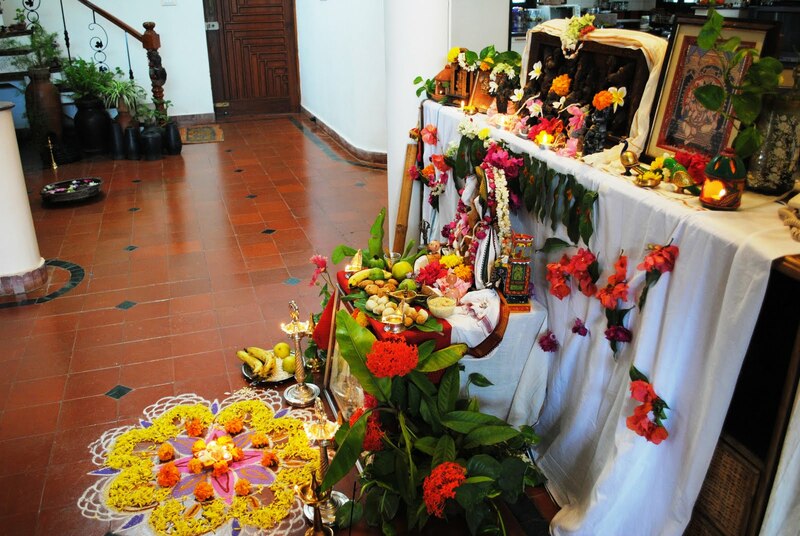 Lovely pictures, especially the key chain just looks awesome:) Beautiful decorations and the kadubu looks mouth-watering! Fantastic! all that I could say.